Chemical Names and Formulas help scientists communicate ideas and data. Classification and nomenclature (naming) are important parts of all sciences. 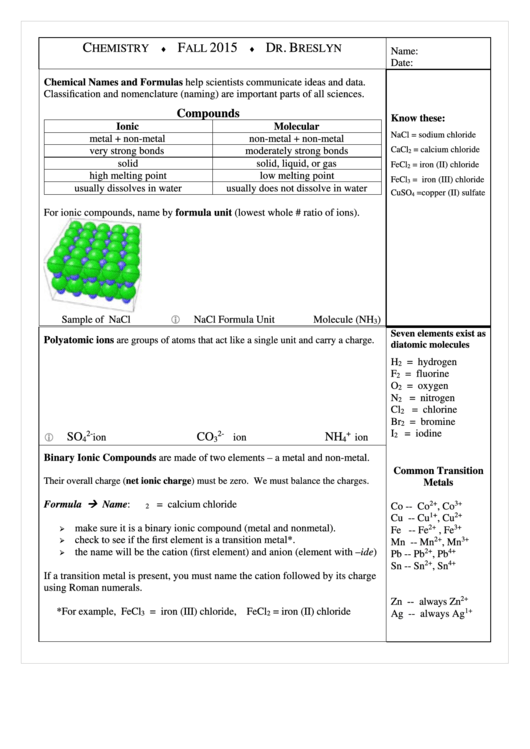 For ionic compounds, name by formula unit (lowest whole # ratio of ions). Polyatomic ions are groups of atoms that act like a single unit and carry a charge. Binary Ionic Compounds are made of two elements – a metal and non-metal. Their overall charge (net ionic charge) must be zero. We must balance the charges. make sure it is a binary ionic compound (metal and nonmetal). check to see if the first element is a transition metal*.